How many entries does a particular faculty member have for Student Supervision for the period Spring 2015 Spring 2016? Then, drill down to determine the number of real entries for the faculty member. 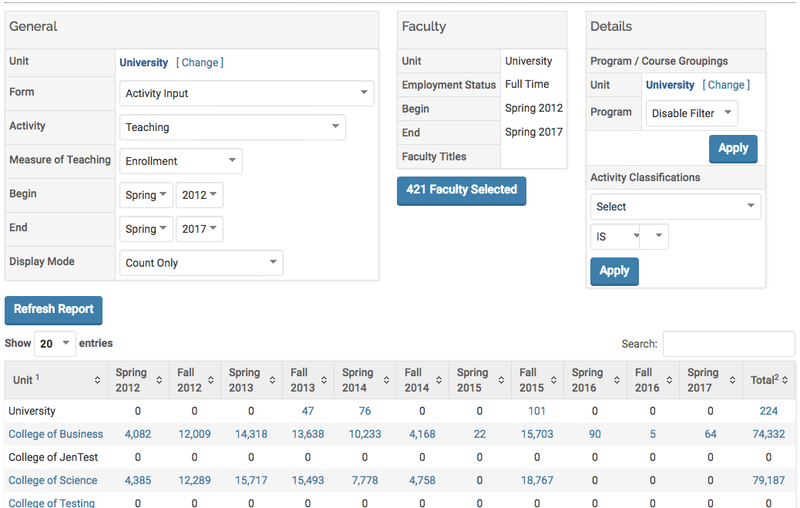 What is the total Advising Load for a faculty member for Spring 2014 to Spring 2016? What is the breakdown by Undergraduate, Masters, Doctoral and Other levels for each term? What is the enrollment count for the College of Business for Fall 2011 through Spring 2012? Select Activity Input Report (under Activity Reports). Form: Select the appropriate Activity Input form. Activity: Select the appropriate Activity Input section. This selects the data to include in the report. Note: Summary includes all sections of the Activity Input Form. Measure of Teaching: Select the measure of teaching. 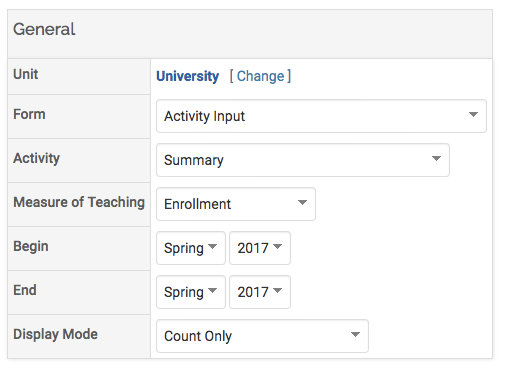 For example, enrollment indicates the number shown is related to enrollment. Begin and End: Select the academic terms for the data to be reported. 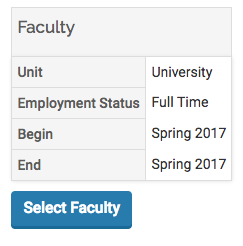 Click the Select Faculty button to use the faculty selection tool to select faculty to include in the report. See documentation on Working with the Faculty Selection Tool to learn how to use this tool. 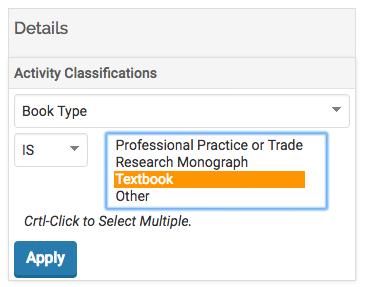 To filter on an activity classification, select the Activity Classification from the drop down. Select the criteria for the activity classification. When you are finished customizing your report, click Apply. 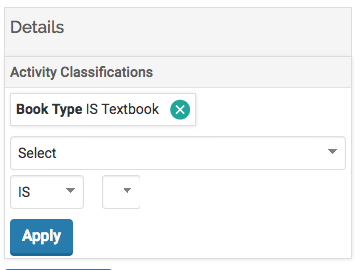 To clear an Activity Classification, click the X next to the filter. Click on any hyperlinks that are available to see a different view of the data. For example, click on the hyperlink for Spring 2015 for the College of Business to view the totals by a faculty member in the College of Business. The total for each faculty member displays. 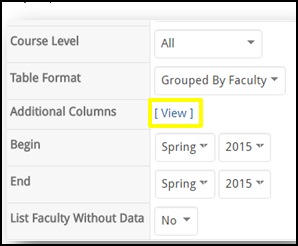 To drill down further and view the details for a specific faculty member, click the number/hyperlink for that faculty member. The details display for the faculty member. To edit the data, click the Edit (pencil) icon. 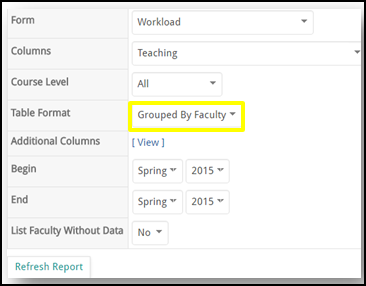 For those sections that can have more than one record per faculty member (i.e. Teaching, Advising Load, Institutional Committees, Grants, etc. ), the report can be grouped by faculty. Click Refresh Report to view the updated report. To add a column to the report, click View. A list of additional columns display. Select the columns to be displayed in the report and click the Update button. The report refreshes to show new columns. 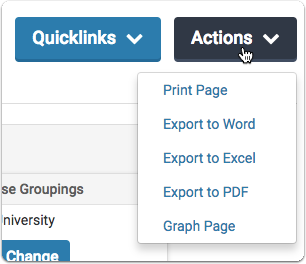 Click in the upper right of the page on Quicklinks link.